Vermont Day-cations: 10 Trips to Explore Vermont's History & Culture | Features | Kids VT - small people, big ideas! 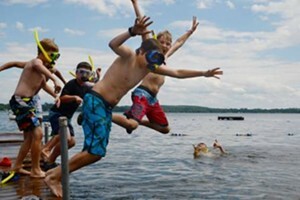 To help you get the most out of this fleeting season, Kids VT presents a three-part series of recommended summer day trips designed to introduce your family to the rich variety of experiences Vermont has to offer. This month's list of 10 "daycations" focuses on the state's cultural and historical attractions, of which there are many. These trips will give you an opportunity to learn about the Green Mountain Boys' role in the Revolutionary War, see how the granite industry shaped the state and discover evidence of the prehistoric days when tropical marine animals were Vermont's only residents. Next month's Kids VT will explore mountains and trails; the August issue will suggest ways to get out on the water. Before humans walked the Earth — before dinosaurs walked the Earth — the Champlain Valley was part of a shallow tropical sea. Take your pint-size paleontologists to see evidence of Vermont's aquatic past at the 81-acre Goodsell Ridge Fossil Preserve and look for fossilized marine life, including stromatoporoids, trilobites and cephalopods that lived 480 million years ago. Now, that's old school. Be ready to walk — no motorized vehicles or bicycles are allowed — and no rocks or fossils may be removed. A one-room museum sheds light on the experience. Call ahead to find out if it's open. St. Anne's Shrine, Isle La Motte: Dating back to 1666, when the French erected a fort and chapel on Isle La Motte, the shrine was once a popular religious pilgrimage destination. Have a picnic on the lakeside grounds, but call to check if the floodwaters have receded first. As they say, God works in mysterious ways. Info, 928-3362, saintannesshrine.org. Allenholm Farm, South Hero: Stop for a maple creemee at this farm and apple orchard, which also has a playground and a petting zoo, and rents bikes. Info, 372-5566, allenholm.com. Food: Hero's Welcome, North Hero: Get lunch at the deli of this century-old general store, or browse an eclectic collection that includes Vermont gifts, toys, games, kitchen goods, books and clothing. Info, 372-4161, heroswelcome.com. If you've been to a summer parade in the Northeast Kingdom — or an antiwar rally in Burlington — chances are you've caught a glimpse of Vermont's resident political puppeteers, whose life-affirming puppetry and pageantry have enlivened the landscape here since the 1970s. 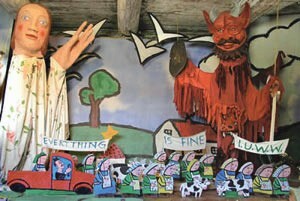 You can always learn about the history of Bread and Puppet Theater, and view a collection of its giant puppets, at the Bread and Puppet Museum. Better yet, come on a Sunday afternoon in July or August to watch them in action. The fun starts with a museum tour at 1 p.m., followed by "little street shows and happenings" at 2:30, with the "Man = Carrot Circus" at three. Don't understand it? Don't worry. The kids will enjoy the spectacle, and the grounds are a great place to run around. Plus, free sourdough rye. Hours: Museum is open daily, 10 a.m. to 6 p.m.
Summer schedule: Annual museum open house, with music and live performances, Sunday, June 5, 1 to 4 p.m. Sunday shows start July 10 and end August 28. Old Stone House Museum, Brownington: Learn about 19th-century Vermont life by touring six historical buildings on 55 acres, including the home of Alexander Twilight, the nation's first African American college graduate and state legislator. Closed Monday and Tuesday. Info, 754-2022, oldstonehousemuseum.org. Parker Pie Co., West Glover: In 2010, Yankee Magazine readers chose this quirky pizza joint as one of the three best pizza places in New England. Closed Mondays. Info, 525-3366, parkerpie.com. The Fairbanks bills itself as a natural history museum, and there is certainly much for budding naturalists to see, including dozens of exotic stuffed birds and a giant stuffed moose. It's also the home base of Vermont Public Radio's "Eye on the Sky" meteorologists. But there's more: The Victorian-era museum's eclectic array of cultural artifacts, including several patriotic "bug art" canvases made from beetles and cabbage moths, lends it a quirky charm that's missing from more modern institutions. Don't rush through it; there are some really odd items under the glass in those display cases. The 50-minute planetarium shows are fun, too. Summer hours: Monday through Saturday, 9 a.m. to 5 p.m.; Sunday, 1 to 5 p.m. Admission: Adults, $8; seniors and children under 17, $6; children under 5, free; families (two adults and their children), $20. 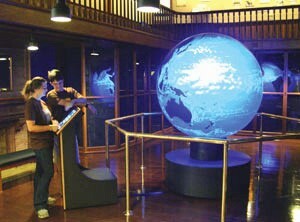 Planetarium shows cost an additional $5. St. Johnsbury Athenaeum: The St. Johnsbury library is full of books, comfy chairs and lots of museum-quality art, though the gallery in back is closed for renovations until late 2011. Info, 748-8291, stjathenaeum.org. Anthony's Diner, St. Johnsbury: Have a Woodsman Burger topped with local produce at this downtown diner. Info, 748-3613. You could spend an entire day at the Shelburne Museum and still not see it all. Electra Havemeyer Webb's vast collection of fine and folk art — 150,000-plus pieces — is displayed in 39 buildings around the property. Explore a historic print shop, jail or apothecary, take one of the daily tours of the steamboat Ticonderoga, or just stroll the grounds and gardens. There are special activities for children in the Owl Cottage Activity Center, plus art safaris and evening events, including a Harry Potter costume party in July. Crafty kids will enjoy this season's "Paperwork in 3D" exhibit, featuring origami, book arts and other paper-based creativity. Admission: Adults, $20; children 5 to 18, $10; children under 5, free; family day pass (two adults and two children 5 to 18), $50; Vermont residents half-price. 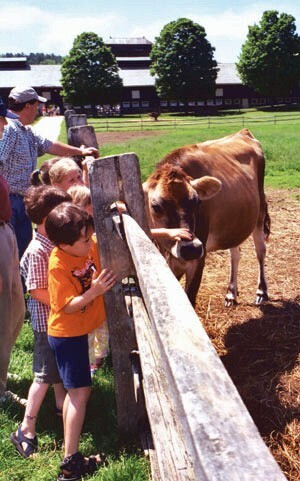 Shelburne Farms: Kids can pet the sheep and milk a cow at this 1400-acre working farm. Parents can snack on the award-winning aged cheddar. Info, 985-8686, shelburnefarms.org. Archie's Grill, Shelburne: Try a local-beef hamburger with hand-cut fries at this quick-service, 40-seat eatery on Route 7. Info, 985-4912. Rock out on a narrated tour of this 600-foot-deep granite quarry. Watch gigantic cranes in action and see quarriers cutting huge blocks of stone. The visitors center explains how Barre's granite industry drew immigrant stonecutters who helped Vermont export this signature product. The arches of the World War II Memorial in Washington, D.C., were made by Rock of Ages, and memorials all over the world feature Vermont's own Barre Gray, Bethel White and Salisbury Pink rock. Stop in at the factory during the workweek to view stone sculptors in action, try your own hand at a sandblasted art activity or bowl on the outdoor granite bowling lane. Hours: through August 31: Visitors center, Monday through Saturday, 9 a.m. to 5 p.m.; quarry tours, Monday through Saturday, 9:15 a.m. to 3:45 p.m.; factory tour, Monday through Friday, 8 a.m. to 3:30 p.m.; sandblast activity, mid-June through mid-August, Monday through Friday, 10:30 a.m. to 4:30 p.m.; Saturday, 11 a.m. to 3 p.m. 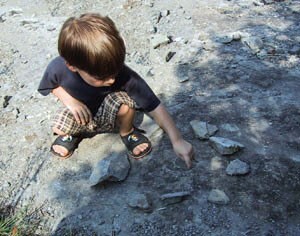 Admission: For the guided quarry tour: adults, $5; children ages 6 to 12, $2.50; children 5 and under, free. Self-guided factory tours are free. Hope Cemetery, Barre: This 65-acre cemetery boasts a distinguished history of memorial art; many of the gravestones were designed by the local stonecutters buried here. Walk or drive through and marvel at their artistry. Vermont History Museum, Montpelier: The exhibits haven't changed in years, but there's no better place to get a comprehensive overview of the state's past. 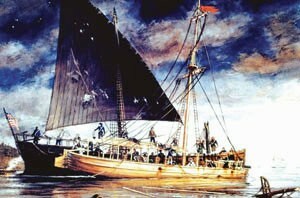 Info, 828-2291, vermonthistory.org. You'd never know it looking at Lake Champlain today, but this strategically located body of water has seen a lot of action over the years. The Champlain Valley's maritime history comes alive at this waterfront museum. Kids can step aboard the 54-foot-long Philadelphia II, a full-size replica of a Revolutionary War gunship that sank during the Battle of Valcour Island. And they can stand on the deck of the schooner Lois McClure. The LCMM is also home to a nautical archaeology center that studies shipwrecks, and visitors can tour these sunken "exhibits" using robotic cameras. The museum hosts multiple events throughout the summer, including the Kids Pirate Festival on June 11 and 12 (see spotlight, page 26). It's also home to the Blacksmith Arts Center. Admission: Adults, $10; seniors, $9; students ages 5 to 17, $6; children under 5, free. Shipwreck-tour price: adults, $22 children, $18. Rokeby Museum, Ferrisburgh: This historic Quaker homestead was inhabited by four generations of the Robinson family. Farmers, artists, authors and abolitionists, they hid fugitive slaves during the 1830s and '40s. Info, 877-3406, rokeby.org. Button Bay State Park, Ferrisburgh: Samuel de Champlain, Ethan Allen, Ben Franklin and Benedict Arnold all trod this 253-acre state park, which is located on a bluff overlooking the lake. Walk the trails, eat a picnic lunch or visit the park's nature center. Info, 475-2377, vtstateparks.com/htm/buttonbay.htm. The Red Mill at Basin Harbor Club, Vergennes: Originally a 19th-century sawmill, this seasonal restaurant's menu include burgers, seafood and salads. Info, 475-2317, basinharbor.com. Teach your kids about early American history at one of Vermont's most important Revolutionary War sites. It's hard to believe, but according to the official Mount Independence website, the military complex there was one of the largest communities in North America in the summer of 1776. That's when 12,000 colonial soldiers built a fort to repel an expected British attack. Their preparations paid off — the redcoats retreated when they saw the fortifications at Mount Independence and Fort Ticonderoga. The British eventually captured the site, and later burned it. Today, trails crisscross the historical area and the remains of the fort. Fort Ticonderoga, N.Y.: Fort Ti predates the Revolutionary War — the French built it in 1755 to defend against the British. It's changed hands a few times since, most memorably when Ethan Allen, Benedict Arnold and the Green Mountain Boys captured it in 1775. Info, 518-585-2821, fortticonderoga.org. Goodies Snack Bar, West Addison: Locals love the large sundaes. Goodies serves actual food, too. Info, 759-2276. Kids get more than a view of the barnyard at Billings Farm — they get to feel the sheep's wool, touch the chicken eggs, pet the horses and enter the stalls. The museum, located in connected barn buildings, is also kid friendly, with no ropes or barriers to keep visitors from the displays on the culture and science of farm life. Also appealing are the wide-open fields, apple orchard and heirloom gardens kids can explore at will. Check out the Children's Corner of the museum shop for turn-of-the-century games like limberjacks and hoops for rolling, as well as other affordable fun — many items are just $1 or $2. Pack a lunch and picnic on the property, or grab an ice cream cone at the dairy bar. Marsh-Billings-Rockefeller Mansion, Woodstock: The mansion, grounds and garden of Vermont's only national historical park are open for tours and viewing. Info, nps.gov, 457-3368, ext. 22. White Cottage Snack Bar, Woodstock: Get your hamburgers, hot dogs, fried clams and creemees. Info, 457-3455. Two U.S. presidents were born in Vermont — Chester A. Arthur and Calvin Coolidge. Arthur's supposed birthplace in Fairfield is underwhelming, but Coolidge's is definitely worth a trip. The site consists of his family's home, a church, a one-room schoolhouse, a general store and the Plymouth Cheese Factory, which is still producing artisanal cheese. Many of the buildings still have their original furnishings. "Silent Cal" was actually sworn in as president at home, shortly after receiving an urgent message from Washington informing him of the death of President Harding. His father, the local notary public, administered the oath on August 3, 1923 — at 2:47 a.m., by the light of a kerosene lamp. Coolidge's grave is on the site, as well. Camp Plymouth State Park, Ludlow: Miners used to dig for gold here, and some people still pan for it in Buffalo Brook. 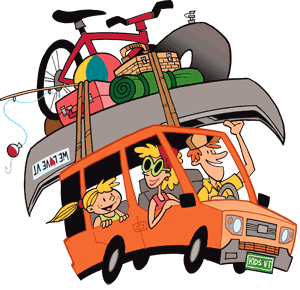 Picnic on Echo Lake, rent a canoe or hike the Vista Trail. There's a concession stand at the park. Info, 228-2025, vtstateparks.com/htm/plymouth.htm. 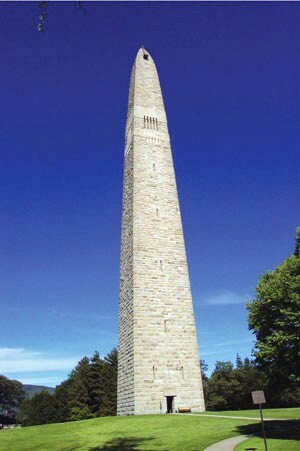 Vermont's tallest freestanding structure is not a skyscraper — it's a 300-plus-foot-tall stone obelisk that commemorates the 1777 Battle of Bennington. The battle itself took place in New York when the Brits tried to capture weapons and food stashed in Bennington. The American forces, including members of the Green Mountain Boys, won the day, which contributed to the British surrender. Learn more about the battle at the monument museum, and ride the elevator up to the observation point. The Bennington Museum: The permanent collection here includes Revolutionary War military artifacts, as well as the largest public collection of works by folk artist Anna Mary Robertson "Grandma" Moses. Info, 447-1571, benningtonmuseum.org. Blue Benn Diner, Bennington: This old-fashioned diner is a melting pot of tourists, locals and Bennington College students. Breakfast is served all day, and there are lots of vegetarian options. Info, 442-5140.